Note: Top, Bottom and Left Margins of full sheets are in straight-edges. Note: Left and Right Margins of full sheets are in straight-edges. CS30. Trophy and "Merry Christmas"
CS31. Trophy and "Happy New Year"
CS34. Trophy and "Merry Christmas"
CS35. Trophy and "Happy New Year"
CS42. 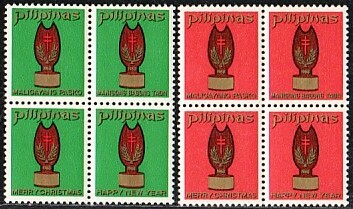 Sampaguita Flowers and "Merry Christmas"
CS43. 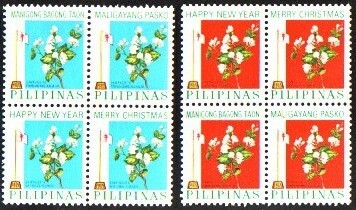 Sampaguita Flowers and "Happy New Year"